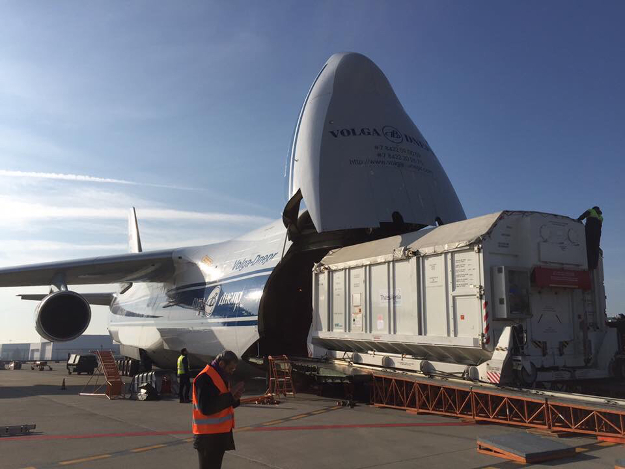 Three heavy-duty Antonov cargo planes flew components of Europe’s ExoMars orbiter and lander from Italy to the Baikonur Cosmodrome in Kazkhastan last week, setting up for a March 14 launch toward the red planet. 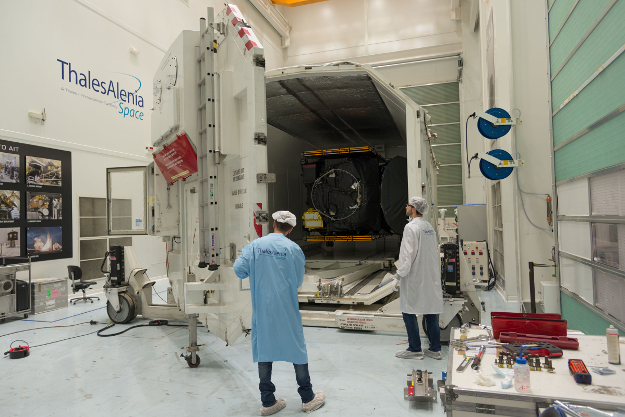 The Mars mission materials will be assembled, tested, fueled and attached to a Proton rocket over the coming months on the first of two launches for the ExoMars program, to be followed by the departure of a European-made rover to the red planet in 2018. Liftoff of the first ExoMars mission is set for March 14, at the opening of a 12-day launch period. 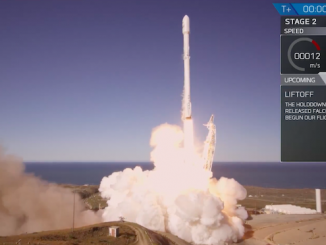 That launch will carry the Trace Gas Orbiter instrumented with sensors to sniff out methane in the Martian atmosphere, plus the Schiaparelli lander, an entry probe that will attempt to achieve Europe’s first successful landing on the red planet. A convoy carrying the two Mars-bound components of the ExoMars 2016 mission, plus a load of ground support equipment, left the Thales Alenia Space factory in Cannes, France, on Dec. 17 en route to Turin, Italy, where three Antonov An-124 cargo flights would take the hardware to Kazakhstan. The three Antonov transport planes departed Turin-Casselle Airport on Dec. 18, Dec. 20 and Dec. 22, carrying equipment to help prepare ExoMars for launch, the Schiaparelli lander and the Trace Gas Orbiter, respectively. The last shipment arrived at the Baikonur Cosmodrome on Dec. 23 after a customs check in Moscow, and ground crews unloaded the spacecraft containers into a clean room to start the launch campaign. One of the first tasks at the launch site will be to set up a temporary tent inside the satellite processing facility at Baikonur. The covering will ensure the Trace Gas Orbiter and Schiaparelli are free of contaminants, keeping with stringent “planetary protection” protocols aimed at safeguarding Mars from Earth microbes. The Baikonur Cosmodrome currently does not have a facility that meets Western planetary protection requirements, according to Walter Cugno, ExoMars program director at Thales Alenia Space, the mission’s prime contractor. 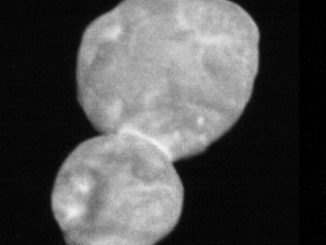 The European Space Agency and Roscosmos — the Russian space agency — signed a final agreement in 2013 to collaborate on the ExoMars program. Russia took over much of the work originally assigned to NASA, such as the provision of launchers and a rover descent package, before the U.S. space agency withdrew from the missions due to budget constraints. 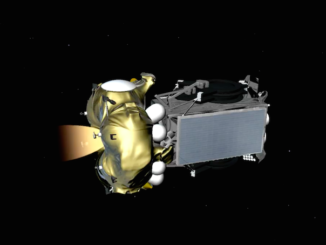 Then teams will initially prepare the two spacecraft for launch separately. Ground crews planned to work nonstop over the holidays to keep the mission on schedule for its March 14 launch date, and perhaps gain some breathing room in the schedule in case something goes wrong closer to liftoff. The Schiaparelli lander, covered in golden insulation and shaped like a flying saucer, will receive propellants for its descent rockets beginning around Jan. 29, according to Cugno. With a full load of fuel, the lander will weigh about 600 kilograms, or 1,322 pounds. Schiaparelli is based on a simplified design, relying on internal batteries and not recharging solar panels for electricity, and cushioned by a “crushable” carbon-fiber structure instead of landing legs or airbags. The lander is stationary, carrying a weather station and sensors programmed to collect data on the layers of the Martian atmosphere during its descent. Engineers expect Schiaparelli to survive between two and four days — or up to eight days if conditions are benign. It is an introductory course to entry, descent and landing at Mars for Europe, which would become the third entity after the United States and Russia to achieve a successful touchdown on the red planet. Workers will hoist the Schiaparelli lander on top of the ExoMars Trace Gas Orbiter around Feb. 12. The duo will remain attached until Oct. 16, when the lander will separate from the mothership three days before arriving at Mars. A three-day procedure to pump 2.3 metric tons (5,070 pounds) of propellants into the Trace Gas Orbiter is scheduled for Feb. 21-24. Combined operations between the spacecraft and launcher authorities will begin Feb. 26. In the final weeks before liftoff, Russian teams connect the ExoMars spacecraft to the Proton rocket’s Breeze M upper stage, enclose it within the launcher’s nose shroud, then roll out the booster for fueling with its mixture of hydrazine and nitrogen tetroxide propellants. Launch on March 14 is currently set for approximately 0930 GMT (5:30 a.m. EST), according to Jorge Vago, ESA’s ExoMars project scientist. 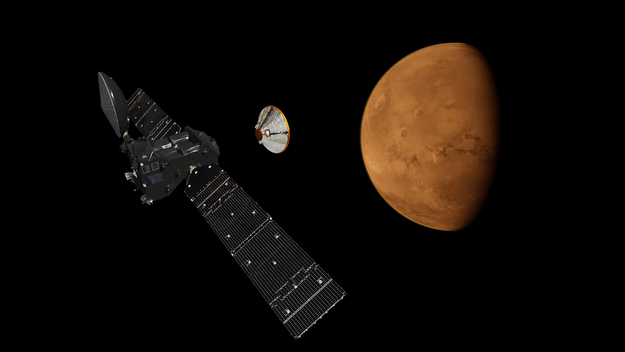 The ExoMars orbiter and lander will be the only Mars mission launching in 2016 after NASA’s announcement last week that the InSight probe will remain on Earth until at least 2018. The InSight lander’s seismometer instrument built to search for quakes on Mars ran into problems with its vacuum enclosure, forcing a delay in the mission’s launch at least until the next Mars launch opportunity in May 2018, the same month Europe’s ExoMars rover is scheduled for liftoff. ExoMars’ launch was originally set for Jan. 7, but an alert from a manufacturer of pressure transducers on the Schiaparelli lander warned officials that the components may be from a faulty batch. Engineers removed the transducers from the propulsion system to eliminate the risk.